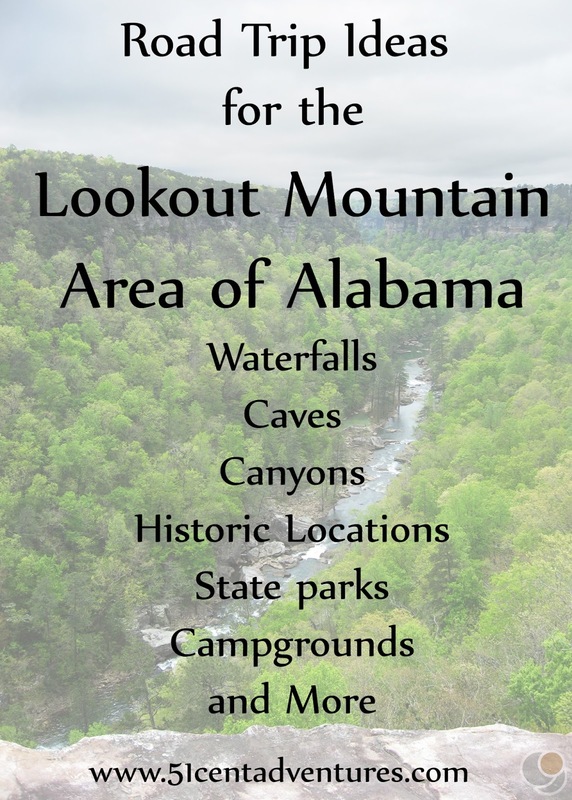 As you know, I've been planning a trip to the Lookout Mountain Area of Alabama for the past several months. I've been eagerly awaiting a break in Brandon's training so we could go. Well the break finally came in April, and we were able to take off for five wonderful days. We spent four nights camping at Desoto State Park on top of Lookout Mountain. Our kids were excited to be camping and having fun outdoors. Brandon was happy to spend time in the mountains again. I was happy to finally visit the places I'd read about in my guidebook. Every day we set out for a different adventure. Mostly we went waterfall hunting, and our efforts were rewarded with eight waterfalls. 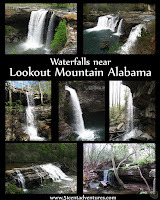 We also explored the Ruby Falls Cave in Chattanooga, Tennessee; saw Saturn V rockets at the US Space and Rocket Center in Huntsville; and discovered one of the best kept secrets in Alabama at Noccalula Falls Park in Gadsden. Overall, it was one of the best vacations we've been on as a family. I know I seem to say that about every vacation, but really this was the best vacation Brandon and I have been on since having kids. Quite a bit of what made the vacation so great was the ages of our children. They have all grown up a lot in the year and a half since our last vacation. The vacation was also great thanks to the amazing scenery of Alabama. This state is beautiful. 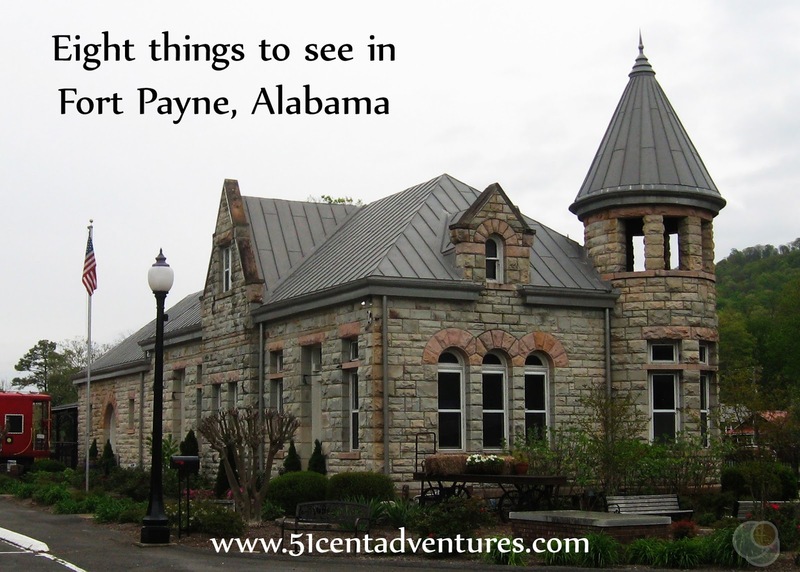 If you live anywhere near Northern Alabama you should make plans to visit some of these places too. Here is the list of the places we went. Click on the underlined text above each picture to go to a detailed post about each place. 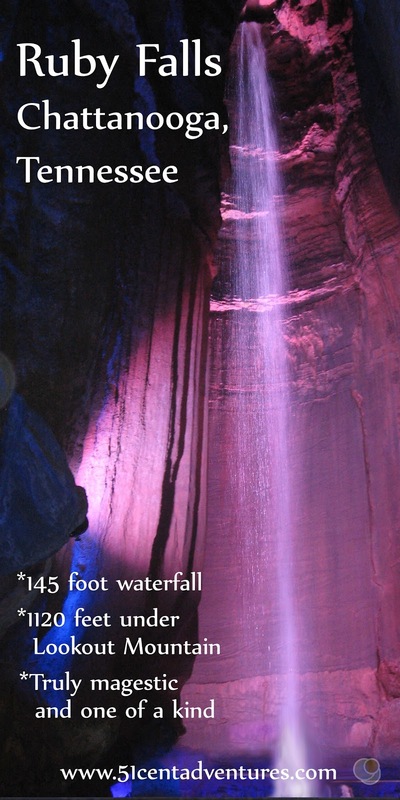 It's easy to understand why Ruby Falls has been called one of the must see attractions of the Southeast. 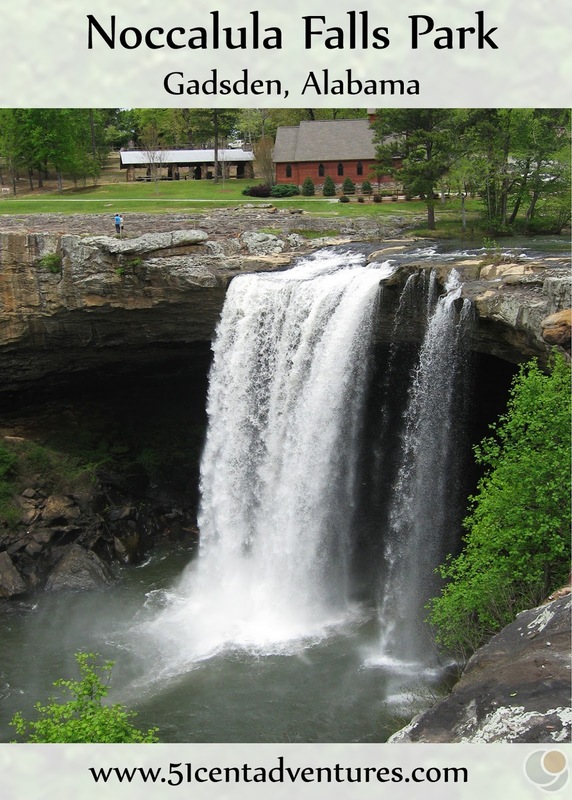 The beautiful 145 foot waterfall is stunning as it falls into a narrow stone chamber. A chamber that was carved by the water itself. But what's even more amazing is that this waterfall is located 1120 feet underground. Equally intriguing is that this waterfall was discovered less than a century ago. At 2,376 feet long the Walnut Street Pedestrian Bridge is the longest pedestrian bridge in the world. The bridge connects the North Shore to Downtown Chattanooga. Strolling across this bridge is a enjoyable activity to add to any trip to Chattanooga. 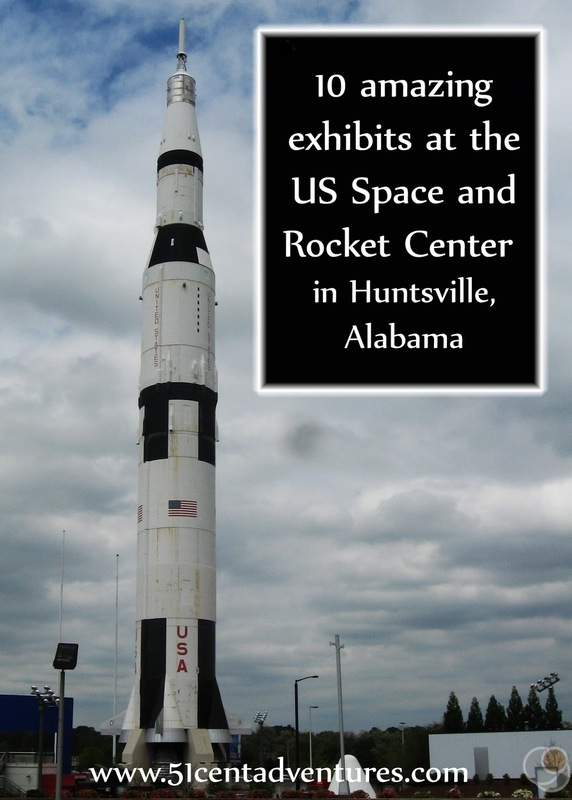 The US Space and Rocket Center in Huntsville, Alabama is home to one of the most extensive collections of technology used in space exploration. Of particular note are the awesome displays inside the Saturn V Hall. These include things like a full size Saturn V rocket, the Apollo 16 Command Module, and the Apollo training simulator. Throughout the massive complex there are opportunities to learn. Opportunities like viewing IMAX movies, attending space camp, rock climbing on a "martian" wall, or even riding on amusement park rides all help visitors learn more about the goes into exploring space. There are so many things to see and do that it's almost hard to know where to start. 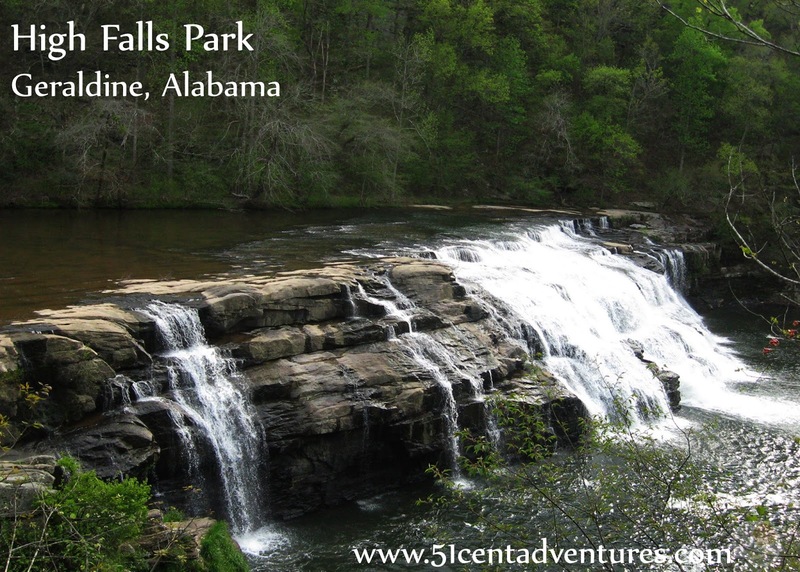 Noccalula Falls Park is the best deal in Alabama. It's also one of the best kept secrets. This city park is home to a stunning 90 foot waterfall. 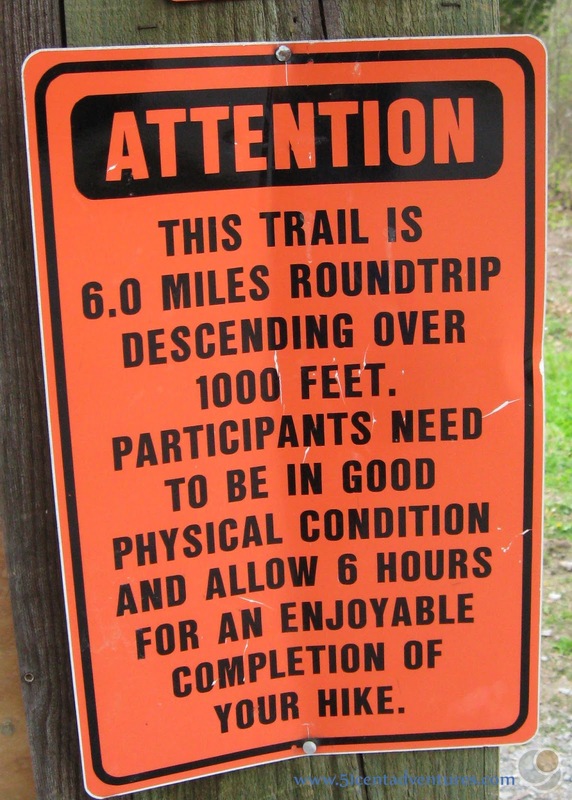 There is a trail that takes you down to the river gorge and even behind the waterfall. The park also contains to a pioneer village, a botanical garden, a maze of rocks, and a small zoo. As if that wasn't enough, unlimited train rides are included in the price of admission. Mount Cheaha is the highest point in Alabama at 2407 feet above sea level. Cheaha State Park is located on top of the mountain. 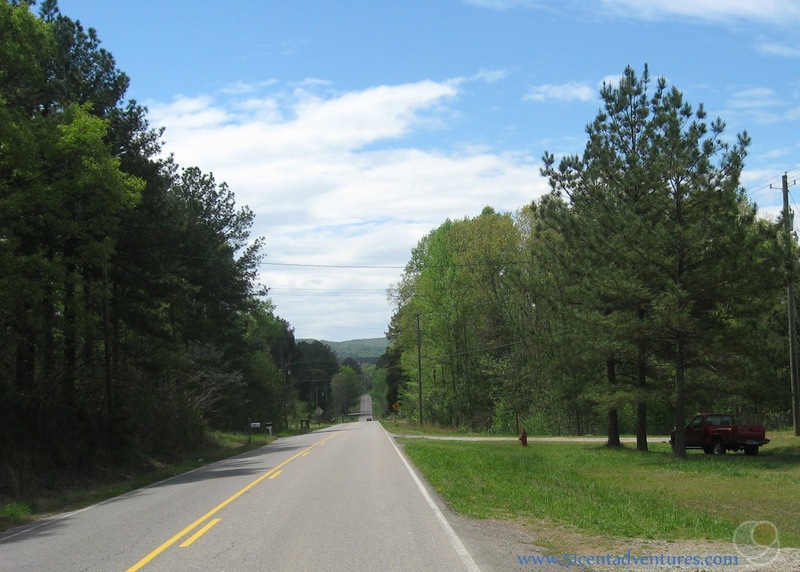 This state park is a mountain resort with a variety of places to stay ranging from campsites to secluded chalets. There is even a restaurant located on top of this mountain. Many buildings were originally built by the Civilian Conservation Corps in the 1930's. 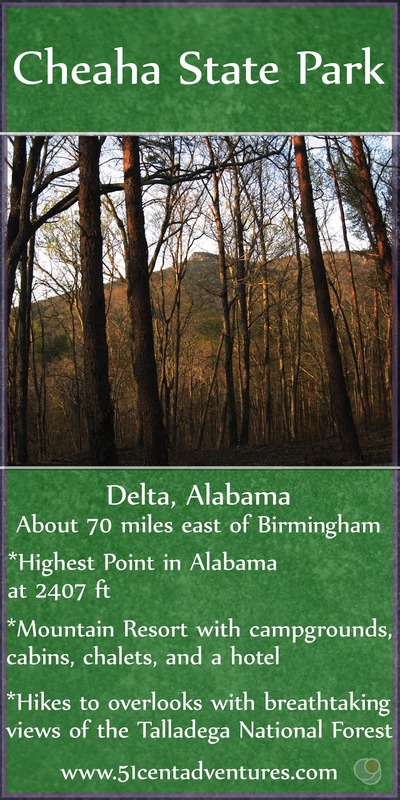 There are many hikes that lead to overlooks where you have a dramatic view of the miles of trees within the Talladega National Forest. 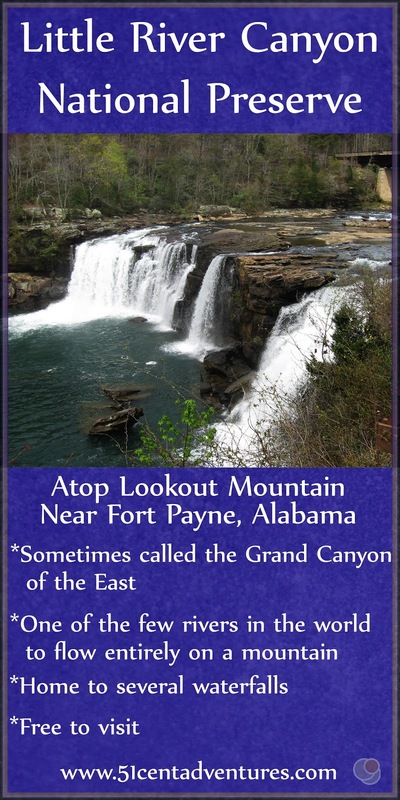 Many people think that Ruby Falls is the only waterfall on Lookout Mountain. But that is not true. 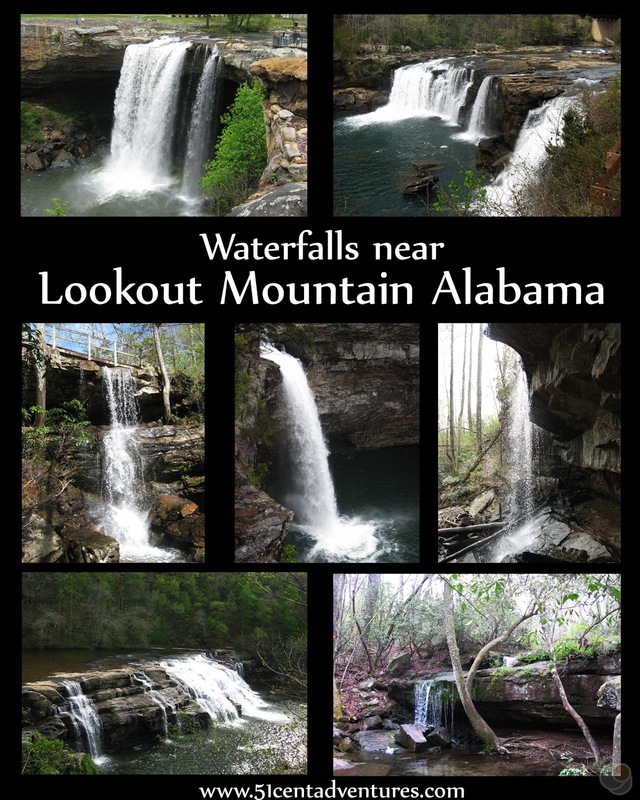 This posts details all the waterfalls you can see while you are visiting the Alabama part of Lookout Mountain. Here is a map to help give you an idea of where all these places are located. I can't wait to share these places with you! 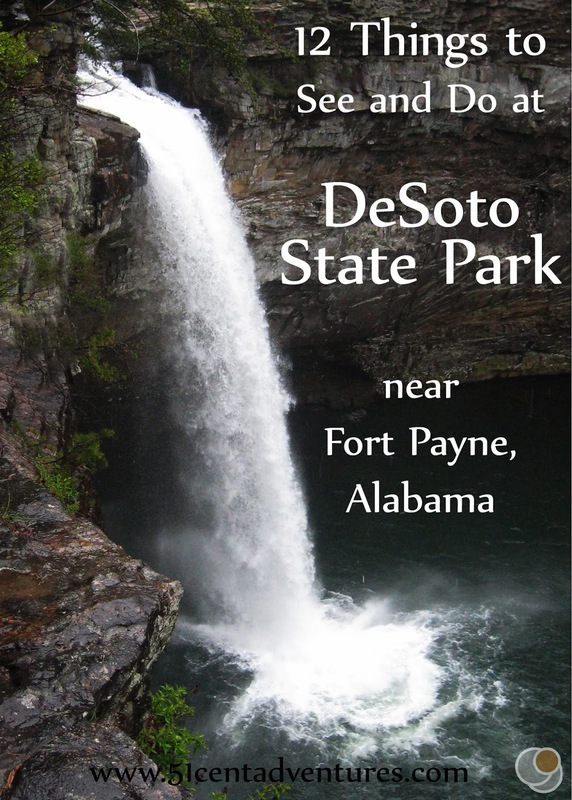 We'll start with the place we spent the most time: Desoto State Park.